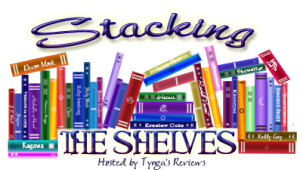 Wow, it’s been six weeks since I last posted a weekly wrap-up/stacking the shelves post! I had planned to take a week off from blogging but as is so often the way real life got completely in the way. I’ve been really struggling with my medical situation and have had a lot of things to contend with. I’m slowly getting back on track but I am still struggling with lack of energy, which is affecting my reading mojo. I need to find better life balance so now I’m working on making time to read and blog and still do all of my physio etc. I don’t think I’ll be blogging at the rate I was before for a while yet but I hope to blog once or twice a week. I’m hoping that having more of a schedule with blogging will help me get back to reading again. Anyway, in recent weeks on my blog I posted a review of The Chimes for the blog tour I was on. It was my birthday in January and I got lots of gorgeous new books so I shared a birthday book haul post. This week I did a WWW Wednesday post, which I always enjoyed joining in with so it was nice to be able to join in again. This week I’ve managed to read three books, mostly they were short books but it’s still such a huge improvement on how much I’ve been able to read prior to this week. I’ve managed to review one of the books. (Please click the link below the image to read my review). This week I’ve bought a few new books with money I had left from my birthday. I received a prize that I won at the end of last year – it’s a gorgeous signed hardback of One in a Million Boy by Monica Wood. This entry was posted in Blog Post, Book Meme, Books, ebooks, Stacking the Shelves, Weekly Wrap Up and tagged Anna Schaffner, Anna Smaill, Books, Claire North, Clare Donoghue, ebooks, Eve Francis, Harriet Evans, Helen Callaghan, Helen Fitzgerald, Helena Sheffield, Lisa Hall, Lynn Sherr, Maggie O'Farrell, Margaret Lazarus Dean, Monica Wood, N. J. Fountain, Rebecca Pugh, Tasmania Perry. Bookmark the permalink. I was thrilled to win it and can’t wait to start reading. Thank you, I’ve missed reading so much so am really hoping I can get back to full speed soon. You are so right about how feeling better is often the key to getting better – I’m going to note this down to remind myself next time I get bogged down. I’ve spent so much time and energy on my physiotherapy and my physical health that I forgot how important it is to allow time for things I enjoy too. Reading helps me relax so it needs to be something I remember to make a priority in my life. Thank you. I’m glad to hear you’re feeling a bit better and I hope you can find a balance in your schedule so you have time to rest and take care of yourself (it can be so hard to fit everything in). Hope you get better soon ♥ These books all look so good! Great haul! The One in a Million Boy is on my wish list. Can’t wait to see what you think of it! Thank you. I can’t wait to read it, I was so thrilled when I won an early copy. I’ll definitely be reviewing it once I’ve read it. Great haul this week, you have a lot of great looking books.The Sudden Appearance of Hope looks really great, I might need to add that one to my wishlist. I hope you enjoy them all 🙂 Here’s my STS. I’ve read The Cry and really enjoyed it too. Maggie O’Farrell is my favourite author, I adore her writing. My husband bought me the @ bookends for Christmas a few years ago as a surprise because we met on twitter, they’re one of my favourite possessions. 🙂 I’ll go look at your post now. I’m glad that you’re feeling well enough to blog. It’s lovely to see you post! ❤ I hope you enjoy these books. Gotta love winning signed books! I hope you enjoy all these. Happy Reading! I like your review books, and I love your @ sign!! Congrats on the signed book, I love those!! I haven't heard of these but they look good. Great haul! The Sally Ride book looks interesting.